On a good day, when all is fair and square, Guardians hunting for glory in the Crucible need not leave empty handed. You may not always dominate, but can be proud to hold your own. So, ignoring lag-switching cheats because they can and must always be reported, let’s look at the tools that usually assure a solid performance. Some are designed to be more potent than others, across all PvP modes including end-game Iron Banner and Trials of Osiris. A couple are surprisingly effective when levels don’t matter. You’ll still need to bring your brain, of course; there’s no replacement for a good head. 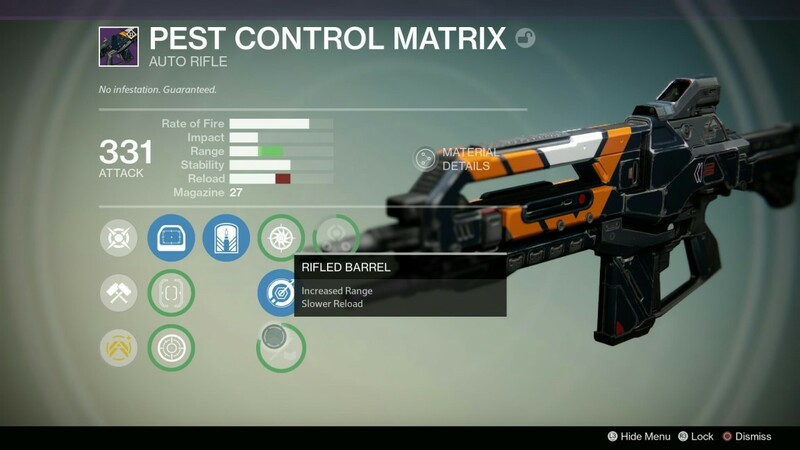 This exotic scout rifle rewards players that think fast while in confident command of a Guardian with maxed-out agility (at the expense of recovery and toughness). 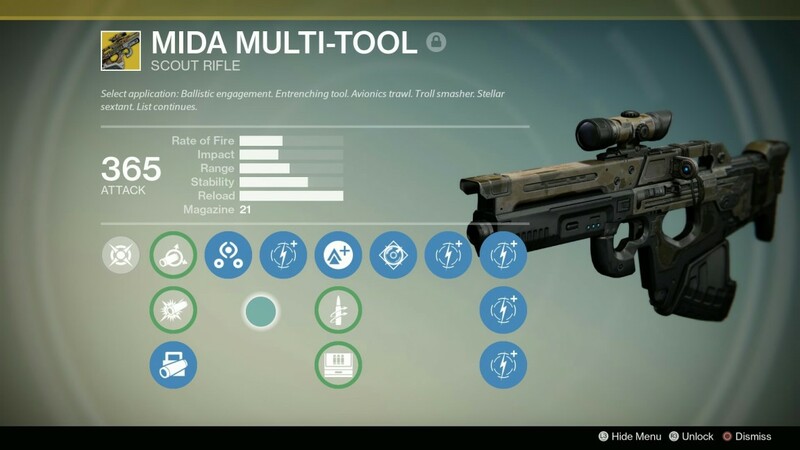 Combined with the MIDA’s +2 agility boost and MIDA perk itself that further increased movement speed you become harder to headshot while more likely to land your own thanks to Smart Drift Control when equipped. Third Eye allows you to remain ADS while keeping an eye on the radar. Success with this hand cannon is not a free ride, but in the right hands it’s a beast. 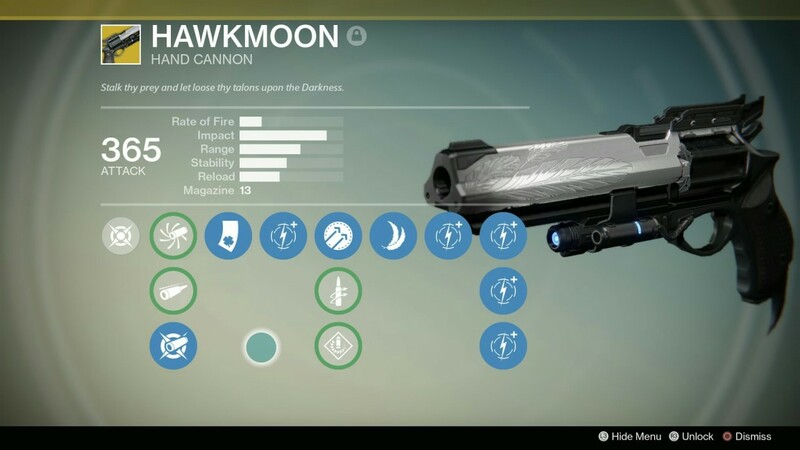 Unlike Thorn and The Last Word that can instantly improve anyone’s post-match results, Hawkmoon requires its master to take a good aim and hold firm, trusting the Luck in the Chamber and Holding Aces perks to work their magic (random bullets causing considerable damage). One shot kills have been known. It is agonisingly tricky to obtain, owing to stingy RNG rate and only one place it’ll ever drop (defeat Atheon on Hard mode, Vault of Glass Raid). However, once in your possession, this exotic fusion rifle that thinks it may as well be an auto rifle is every bit as insane as the community claims. 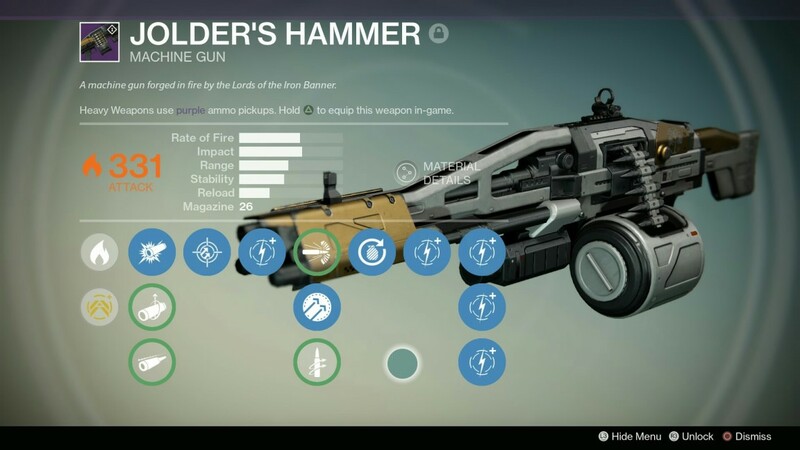 Since the House of Wolves update Vex has been returned to its former glory; hilarious with its 365-damage. We favour Send It to improve range and accuracy, over Extended Mag for a larger magazine. 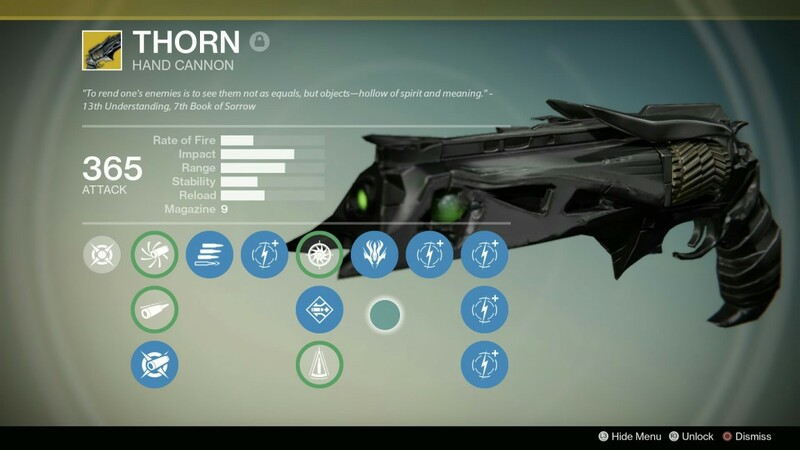 At the time of writing, Thorn is just about the most cursed gun in Destiny PvP ever. The poison-packing hand cannon isn’t too difficult to obtain; a gift for completing A Light in the Dark exotic bounty. Its main perk, Mark of the Devourer, causes ‘lingering damage over time’ and this is what makes it so feared (loathed) if on the receiving end of two swift headshots: snap, snap, fizzle. The rate of Fire combined with Hip Fire bonus accuracy enables most Guardians to drop enemies before they know what’s hitting them. At that point it’s too late. 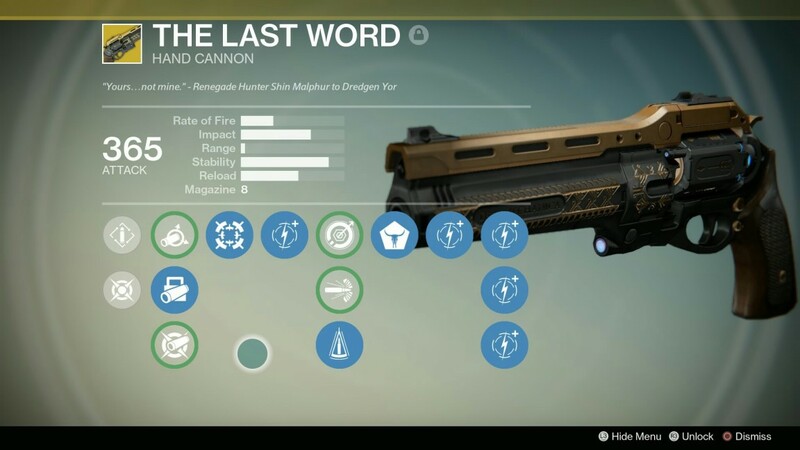 The unique Last Word perk on this exotic hand-cannon further enhances damage when not aiming down sight while adding to stability. It means that those of you with fast reflexes can focus purely on first-sightings before letting loose. We also mention this in PvE, and for mostly similar reasons. Praedyth’s Revenge is ultra stable, fast to reload with Feeding Frenzy unlocked and its headshots result in pretty explosions. In fact, its behaviour is closer to a scout rifle with next to no recoil and low zoom scope to aim all six bullets from the magazine. 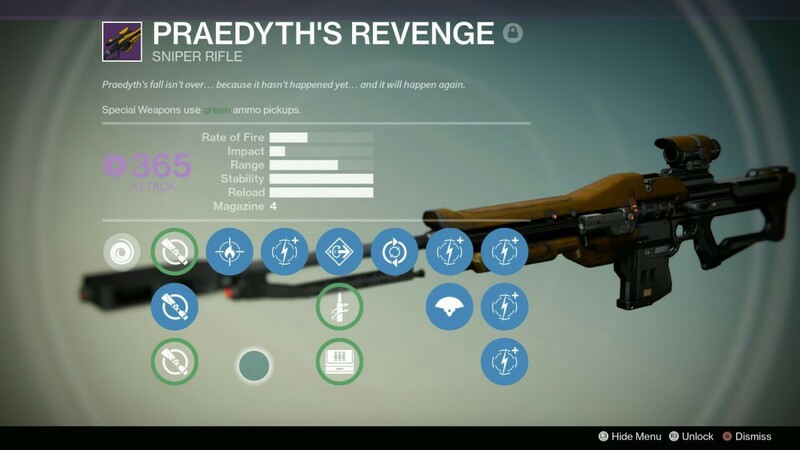 We prefer this to the heavier-hitting Efrideet’s Spear, mainly for rate of fire. A very special RPG for PvP, with the largest blast radius and extremely high velocity; this legendary drop can be rolled with perks that include Grenades and Horseshoes for early detonation based on proximity, and Tracking in case there’s one guy in particular you’re after. Area of effect damage and ridiculous launch speed takes care of the rest. Even better if you’ve Tripod, putting three in the tube! 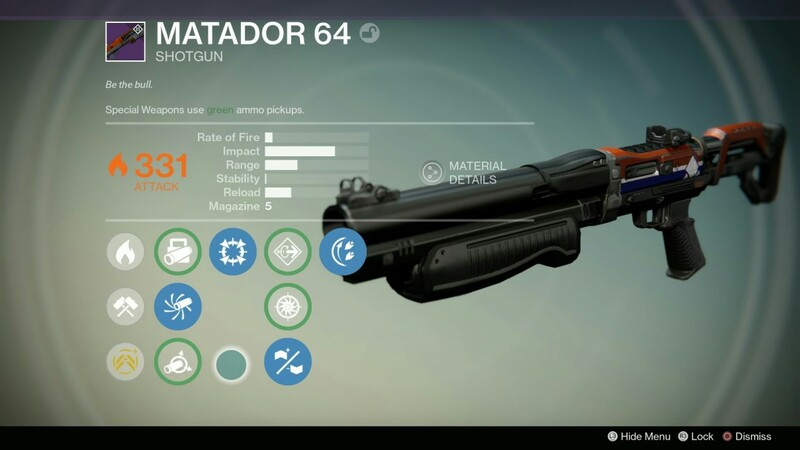 Unless shotguns are seriously nerfed in future updates, the appeal of the legendary Matador 64 is unlikely to wane. 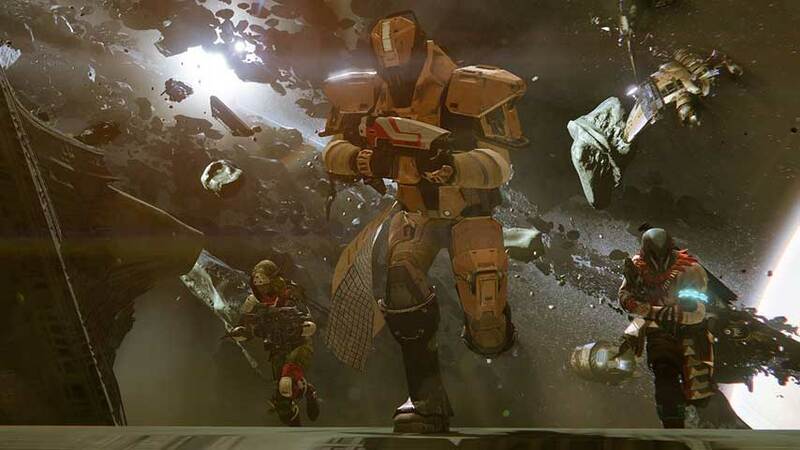 It was introduced with the House of the Wolves DLC, swiftly challenging the Iron Banner’s elusive Felwinter’s Lie for supremacy. There really is very little to separate the two, only – incredibly – Matador 64 comes out on top with a higher rate of fire. It’s surprisingly common too. The new Shadow Price. 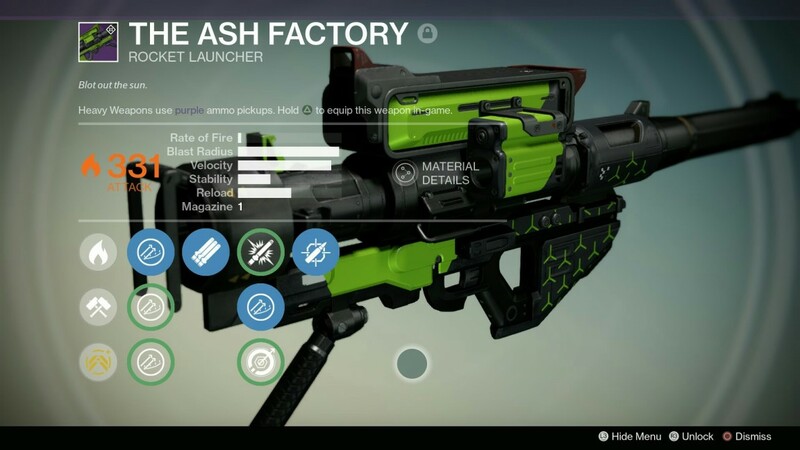 With an auto-rifle, the trade off is between rate of fire and impact. Atheon’s Epilogue (Vault of Glass) and Necrochasm (requiring the Crux from Crota’s End) are great examples of how damage is quite often miniscule. The PCM manages to deliver a high impact for an auto which, boosted by Crowd Control and Glass Half Full, really starts to add up during sustained fire. 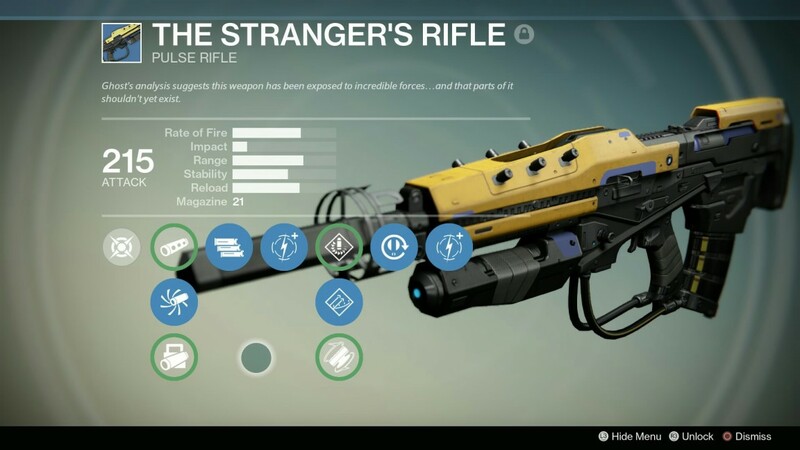 All Guardians receive this rare pulse rifle upon completing the original story quests. Initially you’ll enjoy it for the aesthetics alone, and a brief advantage in PvE. But where this gun really shines is in vanilla Crucible, where level advantages do not apply, allowing base stats to do the talking. You can begin landing shots from distance and it only takes three hits to topple regular shielded enemies. 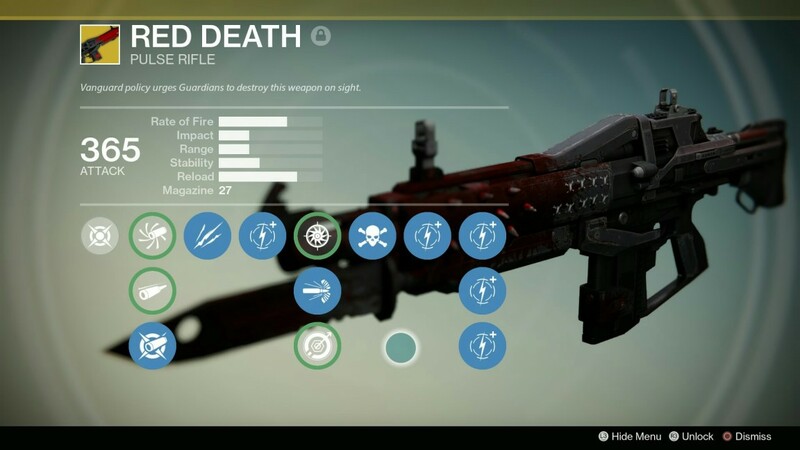 Red Death is one of the few true celebrity guns in Destiny that also manages to keep its dignity. It is extraordinarily powerful, but only in the right hands. High Calibre rounds stagger opponents after Unflinching Rounds allow you to hold steady while under fire. The Red Death perk provides a full heal after each kill and speeds up reloads, emerging in a highly aggressive rhythm for PvP. Against All Odds is widely seen as the strongest all-rounder for PvP, combining crazy impact with range and rate-of-fire, but we’ve enjoyed solid success – particularly concerning the Iron Banner headshot bounty – with Jolder’s Hammer. Ours has Persistence perk, which combined with Hammer Forged has allowed us to pop helmets from range using Jolder’s slow and steady rate of fire. 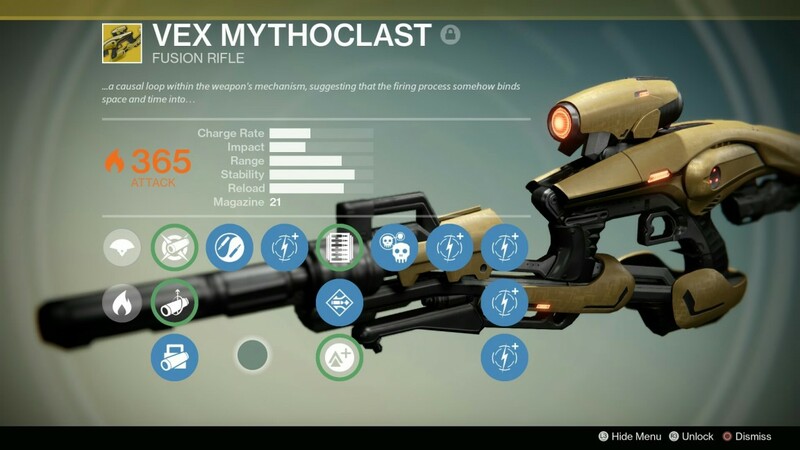 Since the Disciple of Osiris had this available for a great run in the Trials, forums and clan discussions have been going crazy. 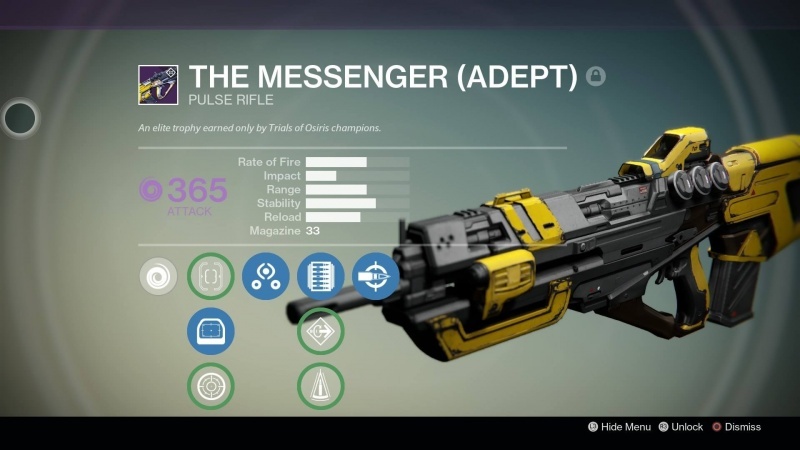 Sadly we are yet to own this legendary pulse rifle, so can only pass along the word of mouth that The Messenger, exclusive to the House of Wolves, is a thing of deadly beauty, with Headseeker (increased precision damage after third shot) and Third Eye on-board as standard.